Now that training camps are upon us, it's a good time to walk through some unsettled/unclear IDP situations around the NFL. I will do my best to provide some clarity on these scenarios, but many won't unravel themselves until the end of preseason or even into the regular season. My hope is this article will provide some guidance for owners in early August drafts that are forced to make decisions on how to value many of the players mentioned below. I'm breaking up this article by position to more clearly walk through all the situations. Denver: In a bit of a welcome surprise for fantasy owners and Broncos fans alike, both Danny Trevathan and Brandon Marshall have been participating (albeit in a limited fashion) in training camp. The big question right now in the IDP community is which player will hold more value. Trevathan was one of the top tackle-producing linebackers in the NFL two years ago, but missed all but one game last year with an injured kneecap. Marshall on the other hand had over 90 solo tackles in 2014 and was a top 10 linebacker in many leagues. The switch to a 3-4 means both players will likely play every down, but my bet is on Trevathan to have the better season. Marshall's Lisfranc injury is more difficult to overcome and I think Danny T is more likely to play WILB - the more productive of the two inside linebacker spots in Phillip's system. Considering Marshall's current MFL ADP is LB18 and Trevathan's is LB39, the decision on who to draft becomes much easier. Go Trevathan. Buffalo: We have a true coin flip situation occurring in Buffalo with owners trying to decide between Nigel Bradham and Preston Brown. The two players have currents ADPs of LB37 and LB36, respectively. Brown is the flashier pick as people are intrigued by his upside, but he struggled to be consistent last year and although he's going to wear the green dot in 2015, he'll likely man the strong side which doesn't bode as well for his overall fantasy value. That said, I expect this situation to turn out similarly to the Jets ILB position in 2014 where both David Harris and Demario Davis had good value. I just like Bradham's consistency and role more. Tennessee: It was recently announced that Avery Williamson is moving to the strong side and will serve as the Titans defensive play caller. He's being drafted 30 linebacker spots or so ahead of counterpart Zach Brown, which I think is a mistake. I just don't see much upside with Williamson. Brown only played four snaps last year as a torn pectoral suffered in Week 1 against the Chiefs robbed him of the entire 2014 season. So he’s not receiving a lot of attention heading right now. During his first two seasons in the NFL however, he compiled an impressive 184 total tackles and 9.5 sacks. He’s back to pre-injury form and has a good shot at locking down an every-down role as the Titans like his speed in open space. Add in Brown’s sack potential and you have a player that makes for a fantastic high upside selection deep in drafts. Green Bay: It looks like the Packers plan to use Clay Matthews at inside linebacker next to Sam Barrington on base downs and will kick him back outside in passing situations. Nate Palmer and Jake Ryan have been rotating inside in subpackages, but neither one figures to see enough playing time this year to have warrant consideration in redraft leagues (unless someone ahead of them gets hurt). Barrington seems to be the player to own here as he will be the only every-down inside linebacker and the Packers could use a lot of lone linebacker sets to get their best players on the field. He's going for a pittance right now in drafts, so you should be targeting him in virtually every league. As for Matthews, he gets a slight bump in balanced leagues, but he's best drafted as a LB3. Arizona: The Cardinals safety situation is a difficult one to figure out right now. My expectations going into the season were that Rashad Johnson and Tyrann Mathieu would be the starting safeties with Deone Bucannon continuing his role as nickel linebacker. The team actually opened training camp with Johnson and Bucannon at safety and then switched to Mathieu and Jefferson the next day. It's likely going to take a few weeks for this situation to work itself out. But for people drafting right now, I'd target Mathieu first, Johnson second, and Bucannon third. Kansas City: The return of Eric Berry to the football field after winning his battle with Lymphoma is obviously fantastic news. But it does muddy the fantasy situation in the Kansas City defensive backfield. Tyvon Branch has been a strong performer for us and was in a prime position to continue that success, but now his role becomes uncertain. The Chiefs will surely bring Berry along slowly and chances are good he doesn't make his way back into the starting lineup until mid-season. He could steal away snaps early in the year from Branch and Ron Parker, however. Branch's skill set more closely resembles Berry and Parker has had a strong training camp so far, so I wouldn't be surprised if Branch got traded (Baltimore?) or ended up being the odd man out. It's a situation I would try to avoid in drafts until we learn more. Washington: Most expected Jeron Johnson to be the 'Skins starting strong safety as the team invested $2.5M in him over two years. That has not been the case so far however as Duke Ihenacho has been running with the first team and the coaching staff seems to be giving him every chance to win the job. There is some fantasy potential here in deeper leagues as we've seen flashes of big box score production out of this position in years past. If you're in extremely deep leagues, Duke is worth a stab in the dark as a DB5/DB6. Carolina: The departure of Greg Hardy leaves a gaping hole at defensive end opposite Charles Johnson. Frank Alexander and Kony Ealy are the two frontrunners to snag that job. Ealy has received more recognition in fantasy circles as he was touted as a high upside, developmental target last year in rookie drafts. The coaching staff seems more bullish on fourth year player Alexander, however. There may be some spot matchup value here, but my gut is telling me we won't see as much production as initially thought. Charles Johnson will likely continue as the only Panthers linemen owned in a majority of redraft leagues. Dallas: The news of Greg Hardy's suspension reduction down to four games was music to Cowboys' fans ears. The team will likely rely on a combination of rookie Randy Gregory and veteran Jeremy Mincey to fill in during Hardy's absence. DeMarcus Lawrence should see full time snaps during this time. Post Week 4, expect Gregory to rotate in with Lawrence and for Mincey to see more time inside. Hardy is the clear player to own here with Lawrence shaping up to be a popular breakout selection in this year's draft. Although I like Gregory, it's rare that rookie defensive ends make much of an impact their first year, so I'm tempering expectations for him. New York Giants: What a situation in New York. Jason Pierre-Paul blows off his right index finger in a 4th of July fireworks accident and suddenly the Giants defensive line is a big question mark. JPP avoided meeting with team management until quite recently and has refused to sign his one year, franchise tender until he passes a physical. There are a ton of unknowns/concerns with him currently. So much so, that I'm passing on him until the DL3-DL3+ tier. The only good news in this situation is that the Giants have a solid stack of young, talent outside in Damontre Moore and Owamagbe Odighizuwa who are chomping at the bit for some playing time. Moore is a bit more seasoned, so he has the best chance of breaking through the logjam and securing enough snaps to be a solid fantasy starter for us. He performed extremely well on a per snap basis last year, so he's a player I've been targeting as my DL4/DL5 with the hopes of DL3-DL3+ upside. Odighizuwa is very nice selection in dynasty formats for those who can wait a year or two for him to develop. Like what you read? Looking to dominate your 2015 Fantasy Football draft(s)? 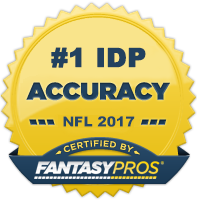 For $5.99 you can get complete access to The IDP Guru's comprehensive and exhaustive 2015 Fantasy Football Draft Guide. Questions, comments, or concerns? If so, please let me know by posting a comment below or emailing me at theidpguru@idpguru.com. You can also hit me up on Twitter.